Adjacent channel selectivity (ACS) is a protection index to determine the capability of a receive filter. Adjacent channel selectivity refers to the capability to receive the power of the local in band channel when the interference signal from the adjacent frequency exists. 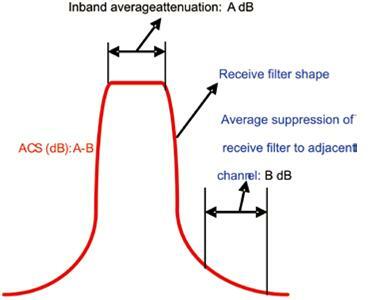 Adjacent channel selectivity is the ratio of the receive filter attenuation on the assigned channel frequency to the receive filter attenuation on the adjacent channel. Hence, Adjacent channel selectivity is the ratio of the receive filter loss on the designated channel to the loss on the adjacent channel. Adjacent Channel Leakage power Ratio (ACLR) is measure of transmitter performance and it is defined as the ratio of the transmitted power to the power measured after a receiver filter in the adjacent RF channel. Alternatively, it can be referred to as the ratio of the average power on the designated frequency point to the average power on the adjacent channel. Adjacent Channel Leakage power Ratio represents the suppression capability of the transmit filter to the adjacent channel. 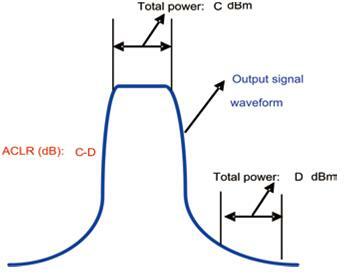 As shown in the figure below, Adjacent Channel Leakage power Ratio is the dB value of C (total transmit power of the designated frequency point) subtracting D (total in-band leakage power of the adjacent channel). The adjacent channel may be used by the same system or a different system. The bandwidth is determined based on the system in the adjacent channel. Adjacent Channel Leakage power Ratio was also formerly called Adjacent Channel Power Ratio and Adjacent Channel Leakage power Ratio is specified in the 3GPP standard. 26 queries in 0.381 seconds.